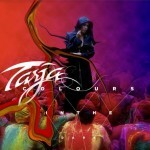 Share the post "Album review: TARJA – Colours In The Dark"
Tarja Turunen is back with her eagerly anticipated new solo album, her first album of new material since 2010’s ‘What Lies Beneath’. The musicians featured on the album include some notable names – Doug Wimbish of Living Color fame on bass and drummer Mike Terrana (Axel Rudi Pell). Kicking off proceedings with the excellent new single ‘Victim Of Ritual’ sets the standards high. This is a belter of a tune, although wait until you hear ‘Never Enough’. The song features heavy guitar riffs and singing from Tarja in her less operatic guise; a top class melodic metal tune and then some. ‘Neverlight’ is another melodic metal beast and one I could see being added to the live set. ‘Mystique Voyage’ recalls her Nightwish days with soaring operatic vocals and string backing. ‘Lucid Dreamer’ is a strange song, featuring plenty of special sound effects to create an almost ‘trippy’ listening experience. I also love the way Tarja weaves the West End musical style and storytelling with metal bombast, best illustrated on ‘Darkness’. A haunting song that stays on with the listener long after the last note has been played… Then for some orchestral pomp look no further than ‘Deliverance’, another tune with a stage musical feel and loving the strings/vocal arrangements on this song. The best thing about Tarja’s albums is that there is enough of her Nightwish past to keep those fans happy and draw in fans like me who never really liked Nightwish much. Tarja’s musical adventure continues taking along her many fans and hopefully gaining a few more new fans along the way. This entry was posted in ALBUM REVIEWS, ALBUM REVIEWS (Mobile), All Posts and tagged album, Colours in the Dark, Nightwish, review, rock, symphonic metal, Tarja Turunen. Bookmark the permalink.